Aromatherapy Room Diffuser, Deodorizers, Air Freshener! AromaMist Color Changing Aromatherapy Diffuser / Ultrasonic Diffusing Mister: No chemicals, no heat. Simply add water and the ultrasonic element generates steady humidification. Add a few drops of aromatic essential oils to boost the mist and offer a calming, aromatic spa environment. AromaMist uses smart, safe, ultra-sonic pulsations to create a long-lasting, relaxing mist. Optional color changing lights add to the ambiance. Just a half cup of water will last up to 6 hours in intervals or 3 hours continuously. The AromaMist will automatically shut off when the water is low. Apdapter included UL Approved. Measures 3.25" H x 6.25" D. ORDER NOW! • AromaMist Color Changing Aromatherapy Diffuser / Ultrasonic Diffusing Mister Silver with Bluetooth: ORDER NOW! 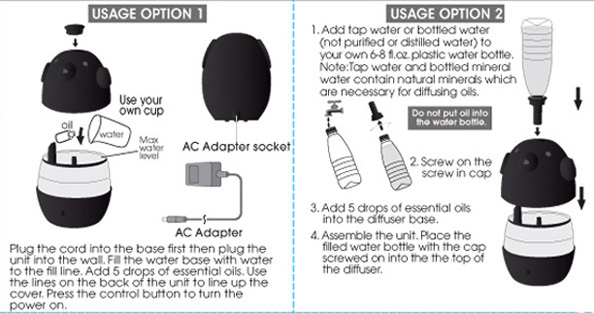 • AromaMist Color Changing Aromatherapy Diffuser / Ultrasonic Diffusing Mister Black: ORDER NOW! • DuraMist Ultrasonic Mister and Fragrance Diffuser Oval Shaped: DuraMist is a remarkable, oval shaped ultrasonic mister and aroma diffuser. Enjoy healthy, aromatic mist for more than 8 hours continuously without refilling. Just add tap water and your choice of essential oil for instant aromatherapy. DuraMist helps set the right mood for any occasion with 16 color lighting options. Measures 6.5" D x 5.75" H. and weighs 1.88 lbs. ORDER NOW! Water Capacity: 10.10 fl. oz. Suggested room size: 300 - 400 sq ft.
Power UL approved, AC adapter included. UltraMist Ceramic Diffusing Mister: No chemicals or heat required. 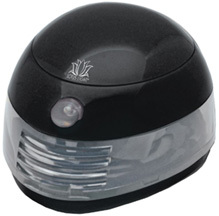 Simply add water and the ultrasonic element provides constant, calming humidification. Add a few drops of pure essential oil (not included) to improve the mist and produce aromatherapy. Works in intervals for 6 hours or nonstop for 3 hours with just a half cup of tap or bottled water. Automatically shuts off when water is low. UltraMist utilizes smart, safe, ultrasonic pulsation to produce a long-lasting, peaceful, mist. Adapter included, UL Approved. Measures 8.50" x 3.50" diameter. • UltraMist Ceramic Diffusing Mister White: ORDER NOW! 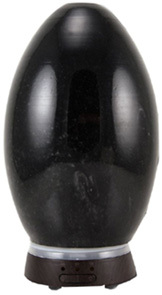 • UltraMist Ceramic Diffusing Mister Black: ORDER NOW! Aromafier Personal Fan Diffuser: Delight in the benefits of pure essential oils by placing a few drops of your preferred Essential Oil (oil not included) on the absorbing pad. Powerful and silent fan provides a comforting. Safe for travel, runs without heat or water. Aromafier helps transform to an aromatic and calming spa environment with the touch of a button. 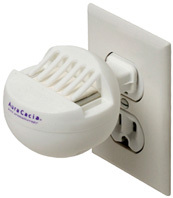 Power your Aromafier with two AA batteries, USB cord or an AC adapter. (Batteries and AC Adaptor not included). Complete with 3 replaceable absorbing pads. Measures 4.25 L x 3.25 W x 2.5 H inches. COMPACT. PORTABLE. TAKE IT ANYWHERE. • Aromafier Personal Fan Diffuser Silver: ORDER NOW! • Aromafier Personal Fan Diffuser White: ORDER NOW! • Aromafier Personal Fan Diffuser Black: ORDER NOW! • Aromafier Refill Pads: 6 Microfiber Absorbing Refill Pads. ORDER NOW! Mini Scentifier Portable Color Changing Fragrance Diffuser: Simply add Essential Oil (oil not included) for a calming and relaxing aromatherapy. Dry diffusion eliminates the need for water and heat. Silent fan transmits fragrance within a range of 100 square feet. Compact design and USB power encourages versatile portability. Apply essential oils directly to the microfiber absorbing material. Includes three Replaceable Ppads. Replace pad when changing fragrances or after extended use. Power your Mini Scentifier with the included USB cord, compatible with any standard USB port. Measures 5" high x 3.125" diameter. • Mini Scentifier Portable Color Changing Fragrance Diffuser Blue: ORDER NOW! 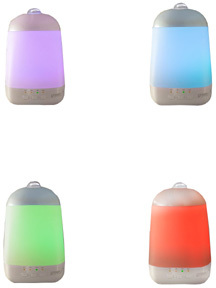 • Mini Scentifier Portable Color Changing Fragrance Diffuser White: ORDER NOW! • Mini Scentifier Portable Color Changing Fragrance Diffuser Lime: ORDER NOW! • Mini Scentifier Refill Pads: 6 Microfiber Absorbing Refill Pads. ORDER NOW! • AromaPod Portable Misting Diffuser: No chemicals or heat needed. Just add water and the AromaPod offers constant humidification. Add a few drops of pure essential oil to improve the mist and make instant aromatherapy. Performs continuously for 4 hours. Automatically shuts itself off when water level gets too low. Measures 3.5 H x 3.50 D inches. ORDER NOW! Suggested Room size: 50 sq. ft.
• Kids Aroma Diffuser & Humidifier: A super adorable diffuser and humidifier combo that emits nice amount of moisture and scent. 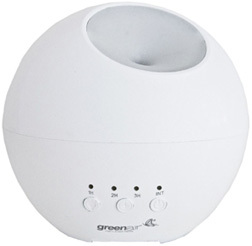 Your child's room just got a lot healthier with GreenAir's new Kid's Essential Oil Diffuser. Kid's Essential Oil Diffuser has an atomizing transducer that transforms essential oils into a cool, aromatherapy mist. Humidifiers provide the wonderful benefits of cool air and moist aromatic mist into dry air, alleviating sinuses, skin, and more. Simply remove top, add tap or bottled water (note: NOT purified or distilled water) to reservoir with 5 drops of essential oils, replace unit dome, and turn on. The unit shuts off when the water runs out. Measures 8 x 4 x 8 inches and weighs 1.5 pounds. Water capacity is 6.8 oz., Runs 8 hours and covers 400 square feet. Two water bottle adapters included for extended run time. BPA Free. Great to use at home and travel! ORDER NOW! 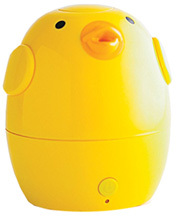 • Kids Aroma Diffuser & Humidifier Lulu the Yellow Duck: ORDER NOW! 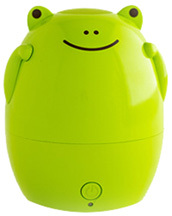 • Kids Aroma Diffuser & Humidifier Jax the Green Frog: ORDER NOW! 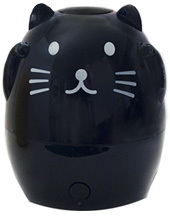 • Kids Aroma Diffuser & Humidifier Mimi the Black Cat: ORDER NOW! 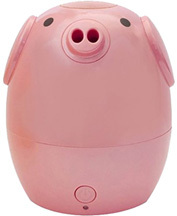 • Kids Aroma Diffuser & Humidifier Rosie the Pink Pig: ORDER NOW! You can direct the mist in any which way you like, which is super useful if you use it on your night stand or office desk. First push turns on the SpaGlo. Second push allows you to select from one of three luminous (mood) colors. Third push turns the lights off while diffusing continues. A fourth push turns the unit off. Adding Essential oils to the water in the SpaGlo transforms your room into a calming spa. SpaGlo provides aromatherapy to promote relaxation and focus, and reducing stress; and add a sense of serenity to any room in your home. SpaGlo generates healthy, micro fine particles that stay suspended in the atmosphere for an extended time. The SpaGlow offers up to 4 hours of Diffusing time and can cover up to 250 sq. ft. Measures 6 x 6 x 6 inches and the water capacity is 4 oz. ORDER NOW! • Ultrasonic Essential Oil Diffuser Serene Living: GreenAir Amber Glass Diffuser provides a serene glow of flair and charm to your home, office, or studio. Hand-blown each egg is exclusive with stunning patterns. Makes a remarkable complement to almost any table, countertop, or desk space. Amber Glass Diffuser offers to any small-sized room into a glamorous escape with essential oils to encourage an environment of rest, stability, and splendor. Simply add 3-5 drops of essential oils to the tank and turn on. GreenAir Amber Glass Diffuser utilizes Essential oils to circulate into an ultrafine vapor, allowing them stay suspended in the air for longer periods of time and better inhalation. Amber Glass Diffuser sits on the eye-catching wood-trim base with On/Off (continuous diffusing), 1 and 2 Hour Timers (controlled diffusing), and 3-Stage Nightlight Dimmer for a soothing nightlight. 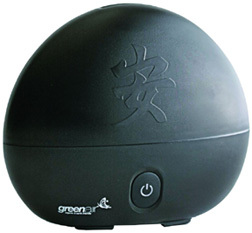 GreenAir Amber Glass Diffuser is handy with quiet operation helps alleviate tension, headaches, and angst. Measures 4.5 x 4.5 x 8 inches and weighs around 2 lbs. Runs up to 7 hours of essential oil diffusing with a water capacity is 13.5 oz. • Ultrasonic Essential Oil Diffuser Serene Living Amber Glass: ORDER NOW! • Ultrasonic Essential Oil Diffuser Serene Living Obsidian Glass: ORDER NOW! Transform your room into a mystifying escape with the aromas of essential oils to encourage a sanctuary of tranquility and stability. Serenity Ultrasonic Diffuser does not heat or damage crucial oil properties, which lets you to delight in all benefits of aromatherapy. Essential oils are circulated into an ultrafine vapor, allowing them stay suspended in the air for longer periods of time and better inhalation. 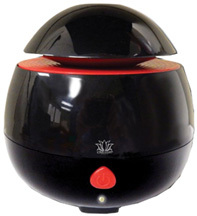 Serenity Ultrasonic Diffuser helps relieve tension, headaches, and anguish. 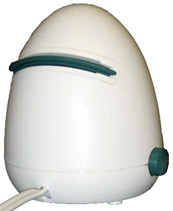 Convenient, quiet operation with a large water tank which providing up to 8 hours of essential oil diffusing. Measures 8 x 4 x 8 inches and weighs 1.5 pounds. ORDER NOW! • Ultrasonic Essential Oil Diffuser SpaMister Milk Glass: Magnificent SpaMister Ultrasonic Diffuser helps circulate soothing essential oils into the air. SpaMister works instantly and uses 60 Hz ultrasonic action to create negative ions that help purify the air and dispersing essential oils into a beneficial mist. It enhances the elegance of a great room, bedroom, office, den or home spa. Diffusing Essential Oils helps encouraging relaxation and focus, and reducing stress to deliver a whole room experience or allow you to direct the vapor closer to an individual. SpaMister measures 5.2 x 5.2 x 10 inches and weighs 1.5 pounds. It is cool to touch and adds a stylish look to any room. Its vase design enhances every decor while diffusing Essential Oil for up to 5 hours and can cover 250 sq. ft. White dimming lights (3 levels). It is BPA Free as well. SpaMister is controlled by a simple push of a button and features two settings: 1 Hour timer and a 2 Hour timer. ORDER NOW! • Ultrasonic Essential Oil Diffuser SpaVapor 2.0: SpaVapor 2.0 merges dependable quality and affordability with a number of modes and setting to customize and broaden your aromatherapy experience. 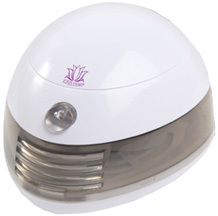 Utilizes ultrasonic technology to atomize essential oil and water into an ultra-fine mist. GreenAir's SpaVapor 2.0 is BPA-free, has a natural pearl-white finish that balances any decor, and is virtually silent. It can be used anywhere, both day and night. SpaVapor 2.0 offers recurrent diffusion settings which assures more than 8 hours of aromatherapy, covering up to 400 sq. ft. of space. The timer allows for 1, 2, or 3 hour settings, all of which are simply controlled by the push of a button. Features rotating LED colored lights (blue, green, purple, and red) which can be turned on/off, and directional misting and auto shut-off when the unit runs out of water. GreenAir SpaVapor 2.0 functions smoothly with therapeutic-grade essential oils without heating them. Helps with pain relief, mood enhancement, treating common colds, and can be used in nurseries, spas, studios, at home or in the office. Can be used to freshen air from strong tobacco, food, and/or pet odors and as a humidifier. Voltage: 100-240V AC. ORDER NOW! • Ultrasonic Essential Oil Diffuser SpaVapor Plus: Spa Vapor Plus Ultrasonic Oil Diffuser is the only unit to diffuse oil instantly while the ultrasonic pulsating sound creates a soothing vapor mist. To diffuse essential oils for aromatherapy benefits, just add a few drops of essential oil into the water to turn your room into a relaxing spa. Quiet, high-output Spa Vapor Plus Diffuser will meet your aromatherapy needs for years to come. Use it anywhere to help you relax and produce a serene environment that is ideal after a long, demanding day. Place your Spa Vapor Plus Diffuser in a sleeping room, great room, office, hotel room or home spa area. 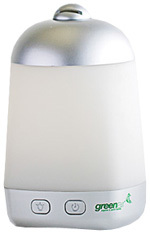 Spa Vapor Plus Diffuser generates healthy, micro fine vapors that stay suspended in the atmosphere for an extended time and is virtually silent so it can be used both at night or during the daytime. It's ultrasonic action creates negative ions that help purify the air. 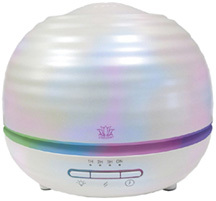 Spa Vapor Plus Diffuser features 6 rotating color LED lights (Purple, Red, Blue, Green) that are controlled by the On/Off switch. Add 5 drops of essential oil for aromatherapy benefit. Water capacity 5.1 oz., runs up to 5 hours, and cover 250 Sq. Ft BPA Free. ORDER NOW! • Ultrasonic Essential Oil Diffuser AromaMister: Magnificent SpaMister Ultrasonic Diffuser helps circulate soothing essential oils into the air. SpaMister works instantly and uses 60 Hz ultrasonic action to create negative ions that help purify the air and dispersing essential oils into a beneficial mist. It enhances the elegance of a great room, bedroom, office, den or home spa. • IRIS Essential Oils Diffuser: Iris Essential Oils Diffuser Is designed with energy saving LED light with 5 color change dispensing pure and natural essential oils without generating pollution. 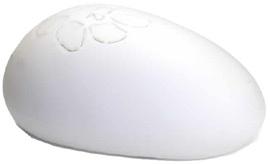 By its unique system of controlled low temperature about 45° C, Iris Essential Oils Diffuser circulates the essence of all the active ingredients of essential oils. Using its capsules, IRIS refines the inside and outside of the home to clean and freshen your environment without pollution and reducing allergens. Helps relieve daily stress, promote sleep, deter biting insects and boost natural defenses. 100% pure and natural of our compositions, for the welfare, health, and of course purifies and perfumes your environment. For use at home, office or away on a trip. Measures L 9 x W 6.3 x H 4.1 inches. ORDER NOW! IRIS Essential Oils Replacement Capsules: The Replacement Capsules comes in a box of 3, each diffuse for 6 days in alternative mode and 4 days in continuous mode active ingredients and pure essential natural oils they contain. To use exclusively with the IRIS Diffuser. 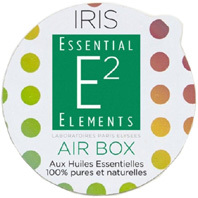 • IRIS Essential Oils Replacement Capsules Better Air Box: 3/Box. ORDER NOW! Ingredients: Aniseed, Basil, Bergamote, Cajeput, Romanian Chamomile, Cinnamon, Cedar, Cistus, Lemon, Citronella, Cypress, Frankincense, Eucalyptus Globulus, Juniper, Geranium, Ginger, Clove, Lavender, Lavandin Grosso, Lemongrass, Lime, Lemon Litsea, Marjoram, Spearmint, Peppermint, Myrrh, Myrtle, Niaouli, Orange, Oregano, Palmarosa, Grapefruit, Patchouli Light, Petitgrain Bigarade, Sylvester Pine, Ravensara, Ravintsara, Saro, Savory, Common Sage, Shiu Wood, Tagetes, Tea Tree, Thyme, Vetiver, Wintergreen, Ylang-Ylang. • IRIS Essential Oils Replacement Capsules Better Night Box: 3/Box. ORDER NOW! Ingredients: Amyris, Angelica, Romanian Chamomile, Cinnamon, Lemon, Eucalyptus Globulus, Gaiacum Wood, Lavender, Lavandin Super, Yellow Mandarin, Marjoram, Lemon Balm, Lemon Litsea, Orange, Petitgrain Bigarade, Ravensara, Ravintsara, Sandalwood, Shiu Wood, Valerian, Ylang-Ylang. 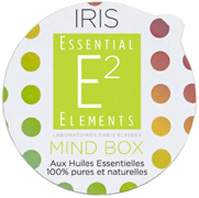 • IRIS Essential Oils Replacement Capsules Mind Box: 3/Box. ORDER NOW! Ingredients: Amyris, Angelica, Romanian Chamomile, Cinnamon, Lemon, Cypress, Eucalyptus Globulus, Guaiacum Wood, Helicrysum, Bay, Lavender, Lavandin Super, Lemongrass, Lemon Litsea, Yellow Mandarin, Marjoram, Peppermint, Lemon Balm, Orange, Patchouli, Petitgrain Bigarade, Ravensara, Ravintsara, Rosemary, Sandalwood, Clary Sage, Shiu Wood, Valerian, Ylang-Ylang. • IRIS Essential Oils Replacement Capsules Better Energy Box: 3/Box. ORDER NOW! Ingredients: Cajeput, Cinnamon, Lemon, Coriander, Cypress, Lemon, Eucalyptus Globulus, Eucalyptus Radiata, Juniper, Clove, Lavender, Lavandin Super, Marjoram, Peppermint, Niaouli, Orange, Oregano, Petitgrain Bigarade, Sylvester Pine, Ravintsara, Rosemary, Saro, Common Sage, Shiu Wood, Tea Tree, Thyme, Ylang-Ylang. • IRIS Essential Oils Replacement Capsules Better Relaxation Box: 3/Box. ORDER NOW! Ingredients: Pharmaceutical-grade Australian Tea Tree Oil (Melaleuca alternifolia) and Lemon-scented Tea Tree Oil (Leptospermum petersonii). • IRIS Essential Oils Replacement Capsules Love Box: 3/Box. ORDER NOW! Ingredients: Amyris, Angelica, Romanian Chamomile, Cinnamon, Lemon, Eucalyptus Globulus, Gaiacum Wood, Clove, Clove Leaves, Lavender, Lavandin Super, Yellow Mandarin, Marjoram, Lemon Balm, Lemon Litsea, Orange, Petitgrain Bigarade, Ravensara, Ravintsara, Sandalwood, Shiu Wood, Valerian, Ylang-Ylang. • Aromatherapy Mist / Ultrasonic Essential Oil Diffuser: Aromatherapy Mist uses ultrasonic vibrations to diffuse a fine, cool mist of essential oils and water. By not using heat, the aroma profile of essential oils is protected. Aromatherapy Mist is a simple modern design of the diffuser works well in any room (Coverage: 538 sq. ft.). Aromatherapy Mist runs quietly, easy to use and clean with Auto shut off, choose between 1 or 4 hour run times. Soft LED candle light with on/off feature. Measures 5.3 x 5.3 x 4.6 inches with Water capacity: 6 fl. oz. Power adapter: AC/DC 100-240V. User manual included. ORDER TODAY! • Aromatherapy Vaporizer: Aromatherapy Vaporizer delivers the combination of essential oils to harmonize your own tastes, moods and emotions. A stream of air circulates the essential oils enhancing the clarity of the oil. This avoids heating the oil which may burn it, modifying the aroma and changing its properties. The natural fragrances help simply for gratification or to create a calming, stabilizing, or invigorating ambience. Contains: Vaporizer Unit, Diffusing Cartridge, Consumer Guide to Product Safety Leaflet. FREE INSIDE: 1/2 oz. Aromatherapy Blend 100% Pure Essential Oil. ORDER TODAY! • Replacement Filter for Aromatherapy Vaporizer: Replacement Filter for Vaporizer. 4" in diameter. ORDER NOW! • Electric Aromatherapy Diffuser: This compact electric Aromatherapy Diffuser plugs in anywhere so you can enjoy the therapeutic benefits of aromatherapy every day. Safe, portable, and easy-to-use., Completely silent, the electric heating element eliminates the need for a noisy fan so you can sleep or relax comfortably and quietly. Simply apply a few drops of pure essential oils to the pad and insert it into the Aromatherapy Diffuser. The heating elements will gently warm the oils and within minutes the scent will diffuse throughout your room. Instructions and 5 Replaceable Pads are included. For use in closed spaces up to 500 square feet. Perfect for the Home, Office, Or Travel. ORDER NOW! Aromatherapy is the use of pure essential oils, which are potent and concentrated extacts of leaves, flowers, fruits, spices, roots, and woods. These complex, highly fragrant substances have a powerful effect through our sense of smell. They can influence our moods, emotions, and memories, as well as purify the air and create a pleasing environment. Our sense of well-being can be enhanced with the pleasures of aromatherapy. HOME CARE: Aromatherapy Diffuser Refill Pads, 10 ct.
• Aromatherapy Room Diffuser: Simply plug in Aura Cacia's Aromatherapy Room Diffuser and, within minutes, you will be enjoying the true aromatherapy benefits that Aura Cacia's 100% pure essential oils provide. Apply 5-15 drops of your favorite Aura Cacia 100% pure essential oil or blend onto the room diffuser refill pad and insert into the diffuser. Plug in the diffuser and enjoy true aromatherapy benefits. A refill pad may be used until it hardens. For best results, use a new refill pad when switching oils. Includes Includes 5 Refill Pads. ORDER NOW!! • Pocket Diffuser: Take this innovative and discreet diffuser with you anywhere you go so slim and trim that it slides right into your purse or pocket. 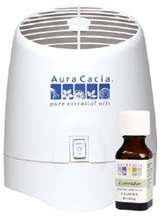 You can enjoy the true aromatherapy benefits of Aura Cacias 100% pure essential oils while you wait for the bus, sit at your desk or even attens a crowded concert. 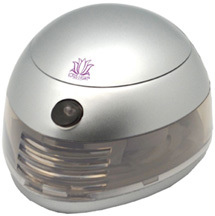 Our Pocket Diffuser is a 3 1/2" x 2 1/2 " battery operated, portable unit that utilizes a fan to disperse the essential oils. Includes an AAA battery and 5 Refill Pads. ORDER NOW! • Car/Room Diffuser Refill Pad: Use with Aura Cacia's Aromatherapy Car/Room/Pocket Diffusers. Follow specific directions for usage for each product. 10 Refill Pads. ORDER NOW! Warning: Avoid direct contact with saturated diffuser pads. Keep refill pads away from children. Do not cover the diffuser when in use. Do not handle with wet hands. Do not store in a damp place. Do not allow saturated refill pads to come into contact with furniture or other household items. HOME CARE: Pocket/Room Diffuser Refill Pads, 10 ct.
• ScentBall Aromatherapy Room Diffuser (Home or Office Air Freshener): With the unique ScentBall Aromatherapy Room Diffuser, you may now enjoy the pleasant fragrance of essential oils as well as their therapeutic effects at any moment, in any room where there is an electrical outlet. Create your own aromatherapy envirmonment with these oils: Lavender for relaxation in the kids room. Tangerine to increase motivation at work. Peppermint to improve concentration in the study. Eucalyptus for easy breathing in the bedroom. Lemongrass to brighten your blues on a rainy day. Patchouli for social gatherings in the living room. Ylang Ylang for greater passion while on vacation. ... or simply mix several different oils onto one pad for a personalized aromatherapy effect. UL approved. Includes 5 extra long pads, ideal for large spaces. ORDER NOW. • ScentBall Aromatherapy Room Diffuser w/ Lavender Oil: One ScentBall room diffuser-good for use with any pure essential oil. One 4 ml sample bottle of pure lavender oil-good for 4, two hour aromatherapy sessions, in a medium sized room. Ten re-useable cotton pads- recommended for use with any pure essential oil that satisfies your mood. Natural fragrances released by your ScentBall diffuser may reduce stress, trigger a pleasant mood or even spark a fond memory. ORDER NOW! • ScentBall Aromatherapy Diffusers Refill Pads: 100% natural cellulose fiber pads for use with any Earth Solutions Belle Fleur premium essential oil in Earth Solutions' unique ScentBall aromatherapy diffuser. Pads should be replaced when they loose their absorbency. 5/Pack. ORDER NOW! HOME CARE: ScentBall Aromatherapy Room Diffuser Refill Pads, 5 ct. The Original Air Purifier Gel: Kanberra Gel® allows the natural antiseptic properties of the oils to become airborne through an evaporative release. As the air circulates and lands on the source (the mold, mildew, etc. ), Kanberra Gel® actually neutralizes the cause of the odors, leaving the air to return to its original fresh state. Lasts up to 45 days. When Kanberra Gel® is working all you should smell is clean air, the way nature intended. No fragrances, no masking and no perfumes, just true fresh air. Kanberra Gel® is for attacking molds, mildew, fungi and their associated odors. No chemicals. Safe to use around kids and pets. Kanberra Gel® is packaged in air-tight, drip-free containers with an inner seal and a lid with holes. ORDER NOW! • Kanberra Gel Original Air Purifier 1 oz. : Covers 100 sq. ft. Use for Sport bags, Lockers, Diaper pails, Hampers, Grabage cans, outdoor gears, picnic baskets, Electronics panels Components, , Lazarette. ORDER NOW! • Kanberra Gel Original Air Purifier 2 oz. : Covers 200-250 sq. ft. Auto/classic car storage, Deck storage lockers, Pet Crates, Litter box areas, Cabins, Bathrooms, Rope Lockers, Closets, Bait Lockers. ORDER NOW! • Kanberra Gel Original Air Purifier 4 oz. : Covers 250-400 sq. ft. Smaller RVs, Bedrooms, Storage areas, Collgege Dorms, Laundry rooms, Storage to small to medium Boats (up to 12 ft.), interior Galleys, Bilge areas, Black water system pipe work. ORDER NOW! • Kanberra Gel Original Air Purifier 8 oz. : Covers 400+ sq. ft. Large RVs, Living Rooms, Attics, Large Bedrooms, Pool Houses, Small basements, Storage to large Boats (up to 40 ft.), Cabins, Storage areas, Sheds. ORDER NOW! 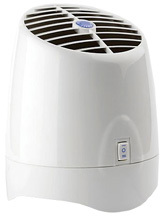 • Kanberra Gel Original Air Purifier 24 oz. : Refill Pouch. ORDER NOW! • All Natural Wipes 30 ct.: Wipes are multipurpose for cleaner surfaces in just one wipe. An all-natural exclusive blend of Tea Tree Oils and other essential oils in a surface wipe. Packaged in convenient 30 count dispensers. ORDER NOW! The All Natural Odor Remover Spray: Spray cleans air and surfaces and remove odors in an instant. Permits the natural antiseptic properties of the oils to become airborne when the spray trigger is pumped. Non-aerosal. • The All Natural Odor Remover Spray 2 oz. : ORDER NOW! • The All Natural Odor Remover Spray 8 oz. : ORDER NOW! Ingredients: Pharmaceutical-grade Australian Tea Tree Oil (Melaleuca alternifolia) and Lemon-scented Tea Tree Oil (Leptospermum petersonii)..
Kanberra Gel 1 oz.aaaaaaaKanberra Gel 2 oz. Kanberra Gel 4 oz.aaaaaaaKanberra Gel 8 oz. HOME CARE: Kanberra Gel Original Air Purifier 1 oz. HOME CARE: Kanberra Gel Original Air Purifier 2 oz. Odor Remover Spray 8 oz. HOME CARE: Kanberra Gel 4 oz. HOME CARE: Kanberra Gel 8 oz. All Natural Odor Remover Spray 2 oz. | All Natural Wipes 30 ct.
HOME CARE: All Natural Odor Remover Spray 8 oz. Ingredients: Aniseed, Basil, Bergamot, Cajeput, Romanian Chamomile, Cinnamon, Cedar wood, Rock-rose, Lemon, Citronella, Cypress, Frankincense, Eucalyptus Globulus, Juniper Berries, Geranium, Ginger, Cloves, Lavender, Hybrid Lavender, Lemongrass, Lime, Marjoram, Spearmint, Peppermint, Myrrh, Myrtle, Niaouli, Orange, Oregano, Palmarosa, Grapefruit, Patchouli Light, Petitgrain Bigarade, Scots Pine, Ravensara, Ravintsara, Green Sandalwood, Gavory, Sage Flower, Shiu Wood, Tagette, Tea tree, Thyme, Exotic Verbena, Vetiver, Wintergreen, Ylang-Ylang. • Aromatherapy Room Mist Better Night 21 Essential Oils: Relaxing Better Night Room Mist is designed to calm tensions and excessive nerves for restful and soothing sleep and wake up full of life and energy. Promotes a soothing effect to deter stress and nerves throughout the day. 3.38 oz.ORDER TODAY! Ingredients: Amyris, Angelica, Romanian Chamomile, Cinnamon, Lemon, Eucalyptus Globulus, Gaiac Wood, Lavender, Lavandin Super, Yellow Mandarin, Marjoram, Lemon Balm, Orange, Petitgrain Bigarade, Sandalwood, Shiu Wood, Valerian, Ylang-Ylang. • Aromatherapy Room Mist Breathe Deep 28 Essential Oils: Breathe Deep Room Mist helps increase natural defenses and protecting against respiratory infections. Breathe Deep Room Mist helps treat and protect your living environment daily against viruses, microbes, bacteria and other attacks on the body. Repeat several times a day as needed. 3.38 oz.ORDER TODAY! Ingredients: Cajeput, Cinnamon, Lemon, Coriander, Cypress, Lemon Eucalyptus, Eucalyptus Globulus, Eucalyptus Radiata, Juniper Berries, Cloves, Lavender, Marjoram, Peppermint, Niaouli, Orange, Oregano, Petitgrain Bigarade, Scots Pine, Ravintsara, Green Sandalwood, Sage Flower, Shiu Wood, Tea Tree, Thyme, Ylang-Ylang. HOME CARE: Aromatherapy Room Mist, 3.38 oz. Odor Eliminating Air Freshener: Odor Eliminating Air Freshener Spray utilizes the natural power to eliminate odors for maximum result. Made from pure and natural citrus oils, Citrus Magic sprays last up to 4X longer than conventional air fresheners. With one spray of Citrus Magic's concentrated formula, you will see how much a little bit can go a long way and immediately see the difference. Citrus Magic Air Fragrances are made from the peel oil of citrus fruit and are packed in unique, non-aerosol, continuous spray containers. ORDER NOW! • Pink Grapefruit: A citrusy perfume with brilliant zingy, fruity aromas to rejuvenate you and bring joyful moods. 3.5 oz.ORDER NOW! • Tropical Lemon: A cheerful and sunny Citrus with a naturally sweet and uplifting fragrance. 3.5 oz. ORDER NOW! • Lemon Raspberry: The balanced blend of Lemon zest and the enchanting fragrance of Raspberry lets you love this blissful perfume, any time of year. 3.5 oz. ORDER NOW! • Tropical Lime: An uplifting delight of clean, zesty Lime that provides a lively experience. 3.5 oz. ORDER NOW! • Tropical Citrus Blend: Original. Experience the spirited, playful melody of Citrus oils. 3.5 oz. / 7 oz. ORDER NOW! • Fresh Orange: Like a ray of golden sunlight the cheerful, sparkly fragrance of luscious Oranges. 3.5 oz. / 7 oz. ORDER NOW! HOME CARE: Odor Eliminating Air Freshener, 3.5 oz. HOME CARE: Odor Eliminating Air Freshener, 7 oz. Solid Odor Absorber: Pure Linen Solid Air Freshener magically absorbs bad odors and freshens the air...Naturally! Using a unique formula that utilizes activated charcoal, Pure Linen quickly absorbs foul odors, and freshens the air with a fresh linen scent! Ideal for odors caused by pets, garbage, smoke, mildew, dampness, chemicals, paint fumes, etc. Place in musty closets to freshen clothes, on the counter to give that "just cleaned" fragrance to bathrooms, and under the car seat to keep your vehicle showroom fresh. Also ideal for use near the cat litter box or placed around the basement to remove that unpleasant damp, musty smell...place Pure Linen all around the house to create a totally fresh living environment! 8 oz. / 20 oz. ORDER NOW! • Solid Odor Absorber Fresh Citrus: 8 oz. ORDER NOW! • Solid Odor Absorber Pure Linen: 8 oz. ORDER NOW! • Solid Odor Absorber Cedar Magic: 8 oz.ORDER NOW! HOME CARE: Solid Odor Absorber, 8 oz. Aromatherapy Mist: Contains a unique blend of our 100% pure essential oils that provide true aromatherapy benefits for the mind, body and spirit. Provides a natural alternative to synthetic air freshners. Use them on the kitchen, bathroom or even at the office. Packaged in a convenient and portable aluminum can that is great for travel, storing in your car or even in your purse. • Relaxing Lavender: (calming & relaxing) Indulge yourself with our quintessential lavender relaxation aroma. The 100% pure lavender essential oils in this Aura Cacia Aromatherapy Mist provide true aromatherapy benefits for your body (relaxes), mind (quiets) and spirit (calms). 4 oz. ORDER TODAY! • Peaceful Patchouli & Sweet Orange: (love, peace & hapiness) Expand your horizons with our free-spirited patchouli and sweet orange blend. 4 oz. ORDER TODAY! • Refreshing Tangerine & Grapefruit: (refreshing & awakening) This fruity, fun mix of tangerine and grapefruit will enliven your day.The 100% pure tangerine and grapefruit essential oils in this Aura Cacia Aromatherapy Mist provide true aromatherapy benefits for your body (nourishes), mind (refreshes) and spirit (awakens). 4 oz. ORDER TODAY! HOME CARE: Aromatherapy Mist, 4 oz. • Herbal Moth Bars: Herbal Moth Bars Natural moth deterrent. Completely non-toxic. Replaces smelly chemical moth balls. 4 Bars, ½ oz. each. ORDER TODAY! Ingredients: Wormwood, Rosemary, Lavender, Mugwort, Vetivert, Tansy, Clove, Mint, Calamus Root, Cedar, Essential Oils & Ecowax. HOME CARE: Herbal Moth Bars, 4 Bars, ½ oz. ea. • Sick Building Feng Shui Spray: TConvert your private setting with this aromatic mist created for healthy air and happy breathing.Exclusive blends of purifying elements help eliminate unpleasant air pollutants and protect against unwanted micro-organisms. This fragrant spray is perfect for protective use in homes, offices, therapy rooms, cars, and any other impacted space. For external use only. 6 oz. ORDER TODAY! Ingredients: Aqua Eucalyptus, Aqua Hamamelis (Witch Hazel), Tea Tree Oil, Spirits of Camphor and Distilled Water. HOME CARE: Sick Building Feng Shui Spray, 6 oz.